So I was reading this article on Yahoo finance and thought it a dang shame that people don't know how much they'll be on the hook for in terms of health care when they retire. The Employee Benefit Research Institute polled 1,082 workers (age 25 and older) and 589 retirees in January and only 1 in 5 have calculated what their health cares costs will be once they hang it up. I asked myself...Well, why? I mean these were (full-time) workers who probably have some sort of health care being provided by their employer as part of their benefits package, and get their check stub every month showing how much is being taken out for insurance. They should also know how much they're spending each month on medicine, co-pays, etc. Are they being lazy? Do they care enough? Is it too hard to factor in future inflation? Out of all of the reasons mentioned above, I think the latter probably has the most to do with why 8 out of 10 workers don't have a clue how much they'll need to pay for health care in retirement. Inflation is tricky. (What rate will you use?) On a side note, please don't assume Medicare will take care of your health care costs. Premiums for all Medicare plans are going up constantly and so will your out of pocket costs. Plus no doubt the government is going to place more accountability on you for your health expenses in the future. 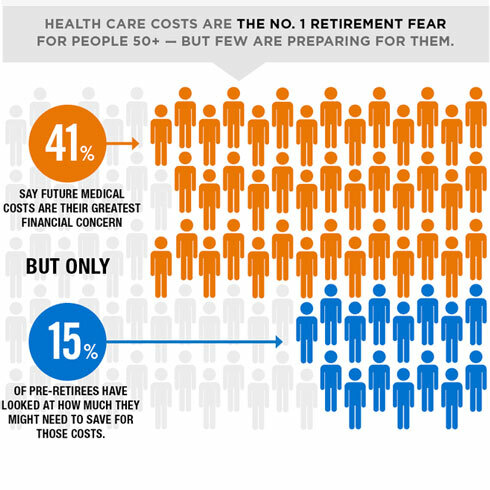 Why should you have an idea of how much you'll need in retirement savings to pay for health care? For starters, so you can get a better estimate of your total retirement number. Mine is $4.45 million by the way. How I came up with this number will be revealed in a later post. A 65-year-old couple retiring this year will pay around $89,012 from now until they die at age 87 (male) and 89 (female) in out-of-pocket expenses with Medicare Parts B and D. If they live longer, they'll need more obviously. But this is good to know. A 55-year-old couple who will be retiring in 2026 will need around $97,433 to pay for their out-of-pocket expenses until 87 & 89 years of age. I'm 40-years-old, so knowing that a 45-year-old couple retiring in 2036 will need around $108,172 to pay for their out-of-pocket dues into their late 80s means I'll need more! If you're interested in budgeting future monthly health care expenses, this same report breaks it down by month for the couple retiring this year. If you want to calculate your health care costs for your particular circumstances, go to HealthView Services Health Care Cost Projector. Don't fill in the data unless you are willing to give them your info, email, name, etc. as that is a requirement to get your individual report. I also tried AARP's Health Care Cost calculator. They pumped out $275K that my wife and I would need to pay for health care costs until age 89 each, retiring at age 65. This seems pretty ridiculous, but at least I didn't need to submit my info at the site to get a number. Look, even if your circumstances are bleak, meaning, you have existing conditions, low-pay, and job insecurity, you still need to make an effort to know around how much you'll need to pay for health care in your retirement years. It's a monthly budget factor you can't ignore. So take the time to go through the readings I've mentioned. Try the cost calculators out. Even if your calculations are off, it still is better than knowing nothing. Thanks for reading! Until next time. If you liked this post, please subscribe by entering your email below and get more like them in your inbox.